Except for eating, drinking and relaxing on the beach, Goan cafe offers Water sports and trips, fishing and dolphin sighting, with local fishermen. The area around Goan cafe is scenic, with lush landscape and quaint villages. All the north Goa beaches and other things to see and do are within easy reach for day trips. 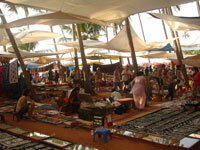 Famous all over Goa the "ANJUNA FLEA MARKET", is worth a visit. Where you can shop, drink, enjoy music and roam around. Buyers and Seller from all round the world can be seen in this market. This market was originally started in 1970's by the foreigners who wanted to sell off their second-hand goods like cameras, watches, clothes etc. Now it has emerged as one of the major attractions of Goa. This market is full of Tibetan craft stalls, Nepalese and Kashmiri artefacts including jewellery, stones, rock bottom priced clothes, Variety of bags, bakery items (cakes, strudel and breads). Other stalls include Tattoing( both permanent & Mehndi), hair cutting etc. Alike the Anjuna Flea Market, this market is also a must place to visit. 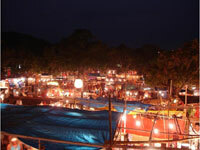 The "Arpora Saturday Night Bazaar" as the name suggests is held every Saturday night, at Arpora village which is just few Kms away from calangute on the way to Anjuna. You will find lot of activities going around over here. The lights in the night atmosphere make this place livelier. Even here there are Buyers and Seller from all around the world. There are many artists performing on the Stage, which is right at the center of the market. Food stalls includes variety that varies from tandoori tikkas to Italian pizzas and pastas. For those who enjoy shopping and eating this is the place to be. Timings From : 7:00 PM till early morning. Airport pickup from Goa (Dambolim), additional trips to HUMPY in Karnataka state, Pune, Aurangabad etc. can be arranged. Daily trips in Ice Land River, dolphin trips, Spice plantation, waterfall, bird sanctuary & animal zoo, and temple churches & nearby state of Maharashtra can be arranged. Rental Bikes & cars are available. Laundry services, safe deposit lockers, garden for kids, money exchange, Credit card facility, Telephone, beauty parlor, free book exchange facility available. The above price is including tasty breakfast i.e. small glass (seasonal) Juice, 2 Eggs (Boiled – scrambled poached or fried), Toast with butter, Jam & tea or coffee. Addition to this you can enjoy Goan Bhajis with bread every alternate day. The above prize also includes free sun bed on the beach. All apartments contain 24 hours running water, cooking equipments, Fridge & coffee maker. If you are blessed enough you might watch the turtle hutching on full moon night which is stoned thrown away from tree huts. Airport pick up. Air conditioning. Rental Bikes & Cars are available. Attached bath with 24hrs hot & cold water. Credit card facility. Laundry Facilities. Currency Exchange facility. Television with cable viewing. Doctor on call, Ambulance. Safe deposit lockers. Free book exchange facility available. Fridge & Coffee maker. Telephone, beauty parlor. Cooking Gas, Cooking equipments. Free use of sun beds on beach for resident guest only.